Get your high octane thrills and live your boy (or girl!) racer fantasies with your DS console and our selection of DS racing games! Racing games are one of the most popular genres available today and the DS certainly has its fair share of racers. From the pure arcade thrills of Mario Kart and Ridge Racer, to the more realistic Race Driver: GRID, the DS now has something for everyone. Mario is ready to race, are you? 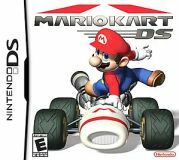 Mario Kart DS - Mario Kart is one of the best loved Nintendo franchises and has been keeping players entertained for over a decade. Now, Mario Kart races onto the DS, with a whole new drift handling mechanism and full multi player capabilities. Is Mario Kart DS on track to entertain thousands more DS players? You can find out in our Mario Kart review. Race Driver: GRID - Most of the racing games on the DS concentrate on pure fun rather than simulation, but Race Driver: GRID is out to change all that. With a huge variety of cars, tracks and even a fully-fledged track editor, can Race Driver: GRID bring the thrills of big-screen console racing to the tiny handheld? Find out in our Race Driver GRID review. Ridge Racer DS - One of the first racing games to launch on the DS, Ridge Racer has always been popular with fans. Its exaggerated drifting and fictional physics make sliding and controlling the cars in corners much easier than in the real world. Is this DS outing worthy of the Ridge Racer name? You can find out in our Ridge Racer DS review. Trackmania DS - Trackmania is one of the most popular "fun" racers on the PC. Players race around daredevil courses taking on loop-the-loops and huge jumps, in a variety of different vehicles. With a thriving community and hundreds of servers and user created tracks, the DS version has a lot to live up to. Check out what we thought of this game by reading our Trackmania DS review. So, whether you enjoy training your brain or tearing up the tarmac, your DS is ready to entertain you. Lets-Play-DS.com is here to make sure you buy the first place games and leave the losers in the pits!